Award-winning author, Kim Brooks, took the Christian Fiction world by storm with the release of her literary debut, He's Fine...But is He Saved? endorsed by The Detroit News as, "...a Terry McMillanlike novel with a Christian twist." A Detroiter who dreamed of becoming an author since first grade, not only did her dream come true, her first self-published book became a National Bestseller for two months straight with Black Expressions Book Club. She next released its sequel, He’s Saved…but is He For Real? published by BET Books, and then her latest novel, She That Findeth which was published by Atria Books, a division of Simon & Shuster, and is about what happens when a 35-year-old single Christian woman, Shenita Love, gets tired of waiting on God for a husband and sets out to find one herself. Not only do readers relate to Shenita Love’s story, Kim Brooks is all too familiar with it. Brooks, a real-live 40-year-old virgin, freely shares her story while speaking, coupled with Word of God in order to promote abstinence or celibacy until marriage, to youth and adults alike, as the best way to the healthiest form of a relationship – one that is built on a foundation of true love, respect, integrity and trust. An English graduate of Michigan State University, licensed minister, and a published author for over a decade, Kim also publishes non-fiction books including, Singles, Overcome!, How To Date and Stay Saved, Get Over Your Ex in One Weekend, Faith in Broken Places, and more. Kim has been a guest singles columnist for and featured in Gospel Today, JET, The Detroit News, and has appeared as a guest on The Word Network, and numerous times on Totally Christian Television, Atlanta Live! and Christian Television Network. Kim Brooks’ ministry and message is spread throughout her books, blogs, songs, articles and poems and has been heard on airwaves nationwide including Rhythm and Praise with Pastor Marvin L. Winans, Strong Inspirations with Dr. Deborah Smith Pollard, The Praise Party with Ace Alexander, Rejoice Musical Soulfood, and many others. As the Founder of Kim Brooks Ministries International, and President of Living While Single (which brings awareness to mental health issues such as depression, suicide and PMDD), Kim also publishes an eNewsletter, The Single Heart, an online daily devotional, and she interacts daily and ministers to members of her private women's support group, Single, Saved and Celibate with Kim Brooks on www.facebook.com/groups/singlesavedandcelibate which currently has over 26,000 members. With a high energy, down-to-earth joyful approach while uniquely blending wisdom from God's Word, Kim brooks powerful message brings hope, purpose and focus to many singles across the world. Living While Single (LWS) provides live events, seminars and webinars that uplift, educate and empower unmarried African-American women, mind, body and soul. LWS also brings awareness and resources to mental health issues such as depression and suicide. 8 million Americans suffer from mental health issues and African-Americans comprise 14% of the population. In partnership with National Suicide Prevention Lifeline 501c(3) Living While Single exists to encourage better quality of life experiences and fight feelings of depression by helping single African-American women live purposeful lives enjoy life now instead of waiting for something to happen or someone to show up. While single...let's live! KBMI spreads the love of God, empowerment and self-worth to women, especially to singles, across the globe through various mediums including print and music publishing, social media, speaking engagements, live events and productions. 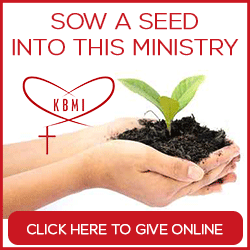 Here at KBMI, our goal is to make at least 100,000 single Christian lives better as a result of following and support. *realize their value and worth is not in a marital status but who they are in Christ. I am worthy and valuable, not because of my marital status but because God made me so. I am celibate until marriage as my reasonable service unto the Lord, and in the mean time I remain focused and use sexual energy toward purpose pursuit and service. I can do all things through Christ and there is nothing too hard for the Lord. There is no time limit or expiration date on my receiving all the promises that He promised me. Marriage is an option that is welcome for someone who recognizes my worth and value and respects my decision to wait as he, is waiting to receive his good thing and added favor from the Lord. Marriage is not a destination as the source of my happiness – the source of my happiness comes from within, comes from God and a worthy candidate for marriage will only add to the peace, joy and contentment that I already have within me and together we will do more for the kingdom of God, more to serve humanity and more to serve one another. It is better to stay single, whole and complete, than be in a relationship that causes me to compromise or settle as it pertains to morals, values and beliefs. Settling is not an option. I will not give in to outside pressures, societal expectations or a number on a calendar to determine when and who I should marry. My decision to marry will be based on peace within that God approves the person and will approve the union. I will marry once I am 100% sure and have peace that this is the man whom God has for me and there will be no confusion or second guessing. "I just wanted to send a message to say thank you for the wonderful books you have written and your words of encouragement in your daily newsletters. I have read most of your books and found them to be very entertaining, refreshing and truly a blessing and may God continue to bless you and your ministry as it has helped me as a young single Christian woman." "You are truly an anointed woman of God. I’ve been receiving your singles devotionals for a little under a year now and they have definitely blessed me. It seems like you write the right words at the perfect time which let’s me know that you allow the Holy Spirit full charge over your ministry. You have helped me to become a stronger single woman of God...May God continue to bless your ministry and provide you with fresh new vision daily." "Thank you for your ministry. When I’m facing something I can trust that when I go to my email you are there with something encouraging to help me put things together. I thank God for you and the Holy Spirit. When I prayed and asked Him to send me a comforter. He lead me to your ministry. Thank you again. If no one else received anything from this I am inspired. May God continue to bless and use your blessings to bless others such as myself." -The Bible is the divinely inspired Word of God. -In the triune nature of God – the Father, the Son, and the Holy Spirit. Three in One. -All have sinned and come short of the glory of God and are in need of salvation. -Salvation has been provided through Jesus Christ for all men. believe and desire to receive it. -Healing is provided in the redemptive work of Christ and is available to every believer. -The Church consists of all those who have received Jesus Christ as their personal Savior. -In water baptism and the observance of the Lord’s Supper. -In the personal, visible, imminent return of Jesus Christ. Subscribe Now And Receive The Single Heart Ezine And A Copy Of Kim Brooks' Ebook, "Singles, Overcome!" ﻿﻿For FRE﻿E﻿﻿. *We respect your privacy and will not share your email address with anyone. 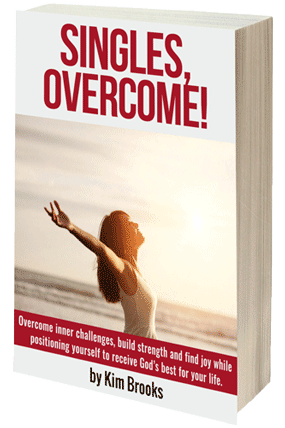 Subscribe Now And Receive The Single Heart Ezine And A Copy Of Kim Brooks' Ebook, "Singles, Overcome!" For FREE.